Homeric word-order is unusually accommodating towards its English equivalent. Verbs usually come where you expect them, adjectives sit near their nouns. Compared to, say, the complex structures of a Pindaric ode, or the elliptical one-line exchanges of dramatic dialogue, Homer’s largely paratactic progression of ‘…and…but…when…then…’ presents his translator with few immediate problems. I found this particularly helpful, as I had set myself a discipline of keeping as closely as possible to a version where the English line corresponded to the Greek. As well as offering easy reference to those studying the poem closely, I found it helped sustain the onward drive of the narrative. 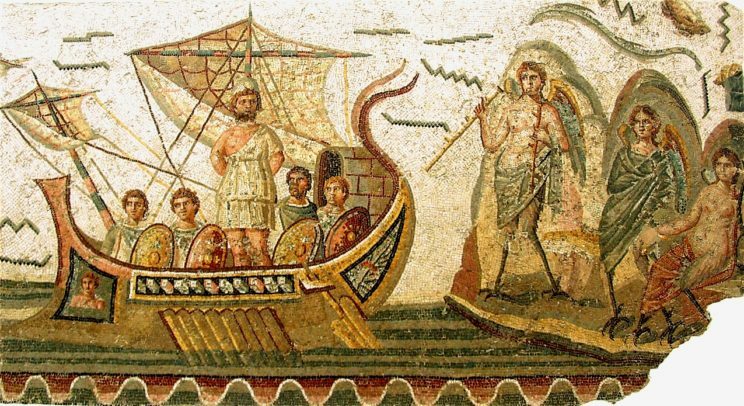 Mosaïque d’Ulysse et les sirènes by Habib M’henni. Public domain via Wikimedia Commons. ‘Why dost thou prophesy so my death to me, Xanthus? It needs not. I suppose there is here an attempt to convey nobility, or elevation (the passage comes after all at a crucial point in the poem). Arnold dealt only with the Iliad, whose tragic theme lends itself to his idea of nobility. Peopled almost entirely by battling heroes, the poem has a kind of relentless grandeur; even the contemporary translator finds that once he has chosen his medium and scrambled on to a certain level, as it were, it is not all that difficult to soar now and then (Richmond Lattimore’s 1951 version and Martin Hammond’s 1987 do this pretty well). The Odyssey is quite different. 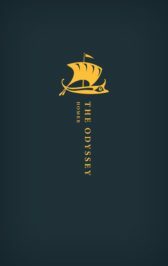 Unlike the earlier poem, with its focus on aristocratic champions seeking honour and fame on the battlefield, the Odyssey’s eponymous character is a different kind of hero – patient, enduring, resourceful, tough and inventive, reliant on cunning for survival in a hostile environment. Moreover, the people he encounters are drawn from a much wider social range than the Iliad’s narrow warrior-world. The Iliad’s action is confined to Troy and the plain outside its walls; by contrast, the Odyssey carries us over much of the know Greek world: royal palaces in the Peloponnese, Crete, Odysseus’ Ithacan home and household in the far west, not to mention his forays into fairyland, where anyone can turn up and anything happen. Much is told in a rapid, plain, and direct way; and there is nobility too. All this means is that the translator has to find a number of separate voices, to describe strange places and happenings and to bring out the tone of exchanges between different kinds of people: Telemachus’ journey in Books 1-4 to adulthood, Odysseus’ adventures with monsters, his trip to the edge of Hades, his stay among the Phaeacians, his time in the swineherd Eumaeus’ hut, the episode with his old dog, the slaying of the suitors, his reunion with Penelope, and much more. It all sounds a big challenge, but I found I was helped in this by a notable piece of Homeric alchemy: the formal language that so exactly suited the Iliad’s high tragic seriousness turned out to be supple enough to convey the domestic and the bizarre – though never at the cost of dignity. Whether the result avoids the opposing pitfalls of banality and pomposity is up to the reader to decide. Anthony Verity is a classical scholar and educationalist whose appointments include Head of Classics at Bristol Grammar School, Headmaster of Leeds Grammar School, and Master of Dulwich College from 1986 to 1995. His translations for Oxford World's Classics include Theocritus, Idylls and Pindar, The Complete Odes, and the Iliad. He has recently translated Homer's The Odyssey. Is it widely known that Arnold’s hexameter translations are not by him but by Arthur Hugh Clough?